Aziz Akhannouch, Agriculture and Fisheries Minister and head of the RNI party, was ranked Morocco’s wealthiest man in Forbes 2018 ranking of World’s Billionaires. Akhannouch, the owner of Akwa group, with a total wealth of $2.2 billion came ahead of his countryman Othman Benjelloun, President of BMCE Bank with $1.7 billion. Akhannouch’s wealth came largely from his majority ownership of Akwa group, a multibillion-dollar Moroccan conglomerate with interests in petroleum, gas and chemicals through its publicly-traded subsidiaries Afriquia Gas and Maghreb Oxygene. It also has businesses operating in media, real estate development and hotels. Akwa Group was founded by Akhannouch’s father, who later took on a partner, Ahmed Wakrim. While Akhannouch serves as Morocco’s Minister of Agriculture and Fisheries, he has handed off day-to-day management of the group to Ahmed Wakrim’s son Ali Wakrim. His wife and brothers also participate in the management of the group. Born in Tafraout in 1961, Ahannouch was educated at Sherbrook University in Canada from which he graduated with an MA in business administration. In 1990, he returned to Morocco to take care of his family’s business where he earned a reputation of being a hard-working boss. Akhannouch was elected president of the council of the Souss-Massa Draa region from 2003 to 2009. In 2007, he served as minister of Agriculture and fisheries. In 2012, King Mohammed VI renewed his mandate at the helm of the same ministry. On August 23, 2013, he was appointed acting economy and finance minister for a short period after the resignation of Nizare Baraka, whose Istiqlal Party had then quitted the first PJD-led coalition government. 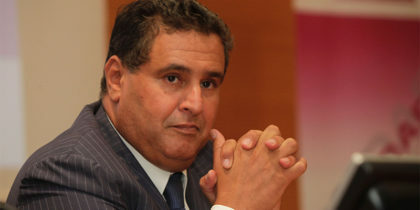 Aziz Akhannouch, who was elected President of the National Rally of Independents (RNI) in 2016, has lately held several meetings across Morocco and gave interviews to a number of local media to explain his party’s political roadmap, the aim being to position himself and his party in the national political landscape by 2021, date of the coming legislative elections. Many analysts describe him as a rational man and a wise politician and already see him as Head of Government after the 2021 elections. Newer PostHas the US Deployed Soldiers in Algeria?